Most people visit us with a large list of places to visit and things to do, however more than a few decide the surroundings are so pleasant that just relaxing with friends and family in the church is all they want to do. Stay in, play snooker or use the sauna and relax. Walk out the front door and join the short Wilsontown Glen Walk or go five minutes further on and explore what’s left of Wilsontown Ironworks (now a Scheduled ancient monument) or go a bit further still and look around Heathland Forest. There are plenty of other walking opportunities nearby including West Forth Woodland and Woodmuir Forest. Nearly all of these areas provide relatively gentle walking with some basic mountain biking runs. 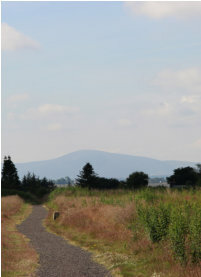 For a longer cycle try the Forth, Wilsontown,Braehead Cycle Route. If you want something a little more strenuous walking climb Tinto Hill, or if mountain biking is more your thing, you can’t go far wrong with Glentress...its mountain bike heaven. There are plenty more mountain runs, but this one should keep even the keenest happy for a while and its under 50 minutes away. Visit Edinburgh.....Castle, Museums, Tours, Shopping, The Festival, The Fringe....more than there is room for to describe here. Visit Glasgow ....Museums, Theatres, Tours, Rennie Mackintosh, Architecture and the Clyde. Follow the footsteps of William “Braveheart” Wallace and visit Lanark. There are plenty of bars and tea rooms here along with small shops, a museum and a farmers market. No visit to this area would be complete without a visit to the World Heritage Village of New Lanark. Visit Biggar and its many museums and Puppet Theatre or go for a day trip to Peebles and its surrounding border castles. Drive to Linlithgow. A beautiful small town with Palace, Lake, and artisan shops. Go a few miles further to South Queensferry. Take a look at the Forth Road and Rail Bridges while trying out some of the excellent restaurants or cross the bridge and go to Deep sea world. Take the kids to the Time Capsule (Waterpark and Ice Skating) or go along to M&Ds, ‘Scotlands Theme Park’. While Forth - Our nearest small town - contains a butcher, a small co-op supermarket, newsagents/grocers, a bank, a chemist, two pubs, a Chinese take away and a fish and chip shop you might want to do something more substantial. Livingston shopping: The Centre including the Designer Outlet, plus cinema, bars, and restaurants. Sainsburys and ASDA deliver to the church. Clyde Valley Garden Centres are plentyful (including Garrion Bridges And Silver Birch). And if all else fails both Edinburgh and Glasgow have substantial shopping areas. While Forth - Our nearest small town - contains a butcher, a small co- op supermarket, newsagents/grocers, a bank, a chemist, two pubs, a Chinese take away and a fish and chip shop you might want to do something more substantial. Livingston shopping: The Centre including the Designer Outlet, plus cinema, bars, and restaurants. Sainsburys and ASDA deliver to the church. Clyde Valley Garden Centres are plentyful (including Garrion Bridges And Silver Birch). And if all else fails both Edinburgh and Glasgow have substantial shopping areas.